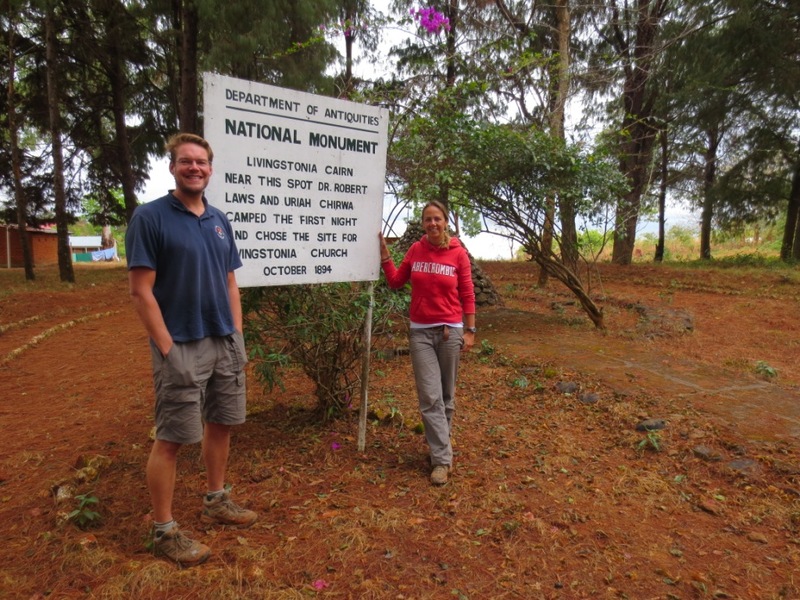 After Balaka, it was time to head north up the lake where we found a complete paradise at Mkuzi beach about half way up. Not only was the setting one of the best yet, we were also excited to be meeting up with fellow overlanders Chris & Jules (osiyeza.net) who are travelling down to Johannesburg from London. Having been following each others blogs it was great to finally meet up and swap stories about where we’d been. We had an awesome few days catching up on each others adventures, as well as making the most of having someone else to talk to other than your own partner. With Chris and Jules both being exactly the same age as us the boys relished some time to chat cars and gadgets and the girls relished talking about everything other than cars and gadgets! 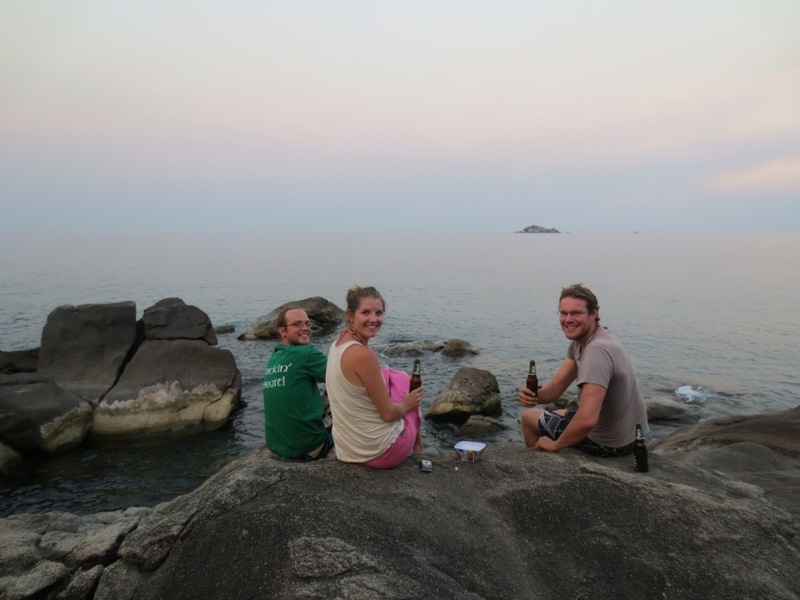 We also bumped into 2 other couples we’d met previously, so there was a fantastic vibe at the camp. Sundowners on the lake with Chris and Jules. To my delight, one of the best stables in Africa just happened to be down the road so I jumped at the chance to finally go horse-riding in Africa. 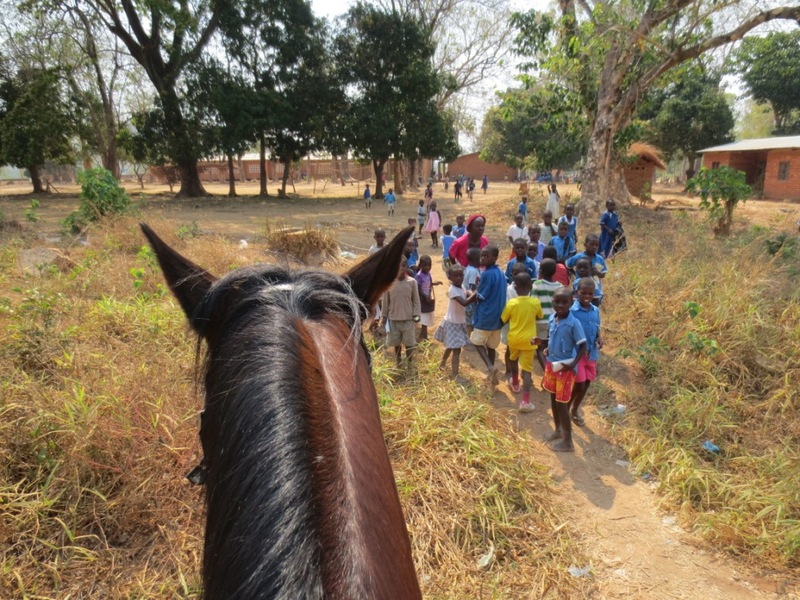 A fantastic experience to ride through the Malawian forests and villages ending with taking the horses out into the lake for a swim to cool off. 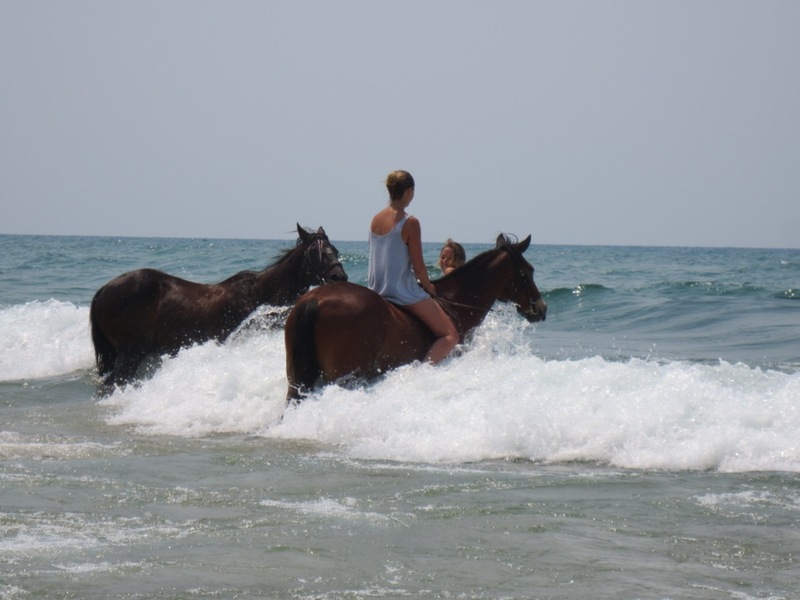 It was very therapeutic to be back on a horse again, but I’ll be walking like John Wayne for weeks! Riding past the local school caused quite a stir! After a few days, it was time to hit the road again. It’s always hard getting back on the road again after a break, and we were all quite sad to be leaving each other’s company. 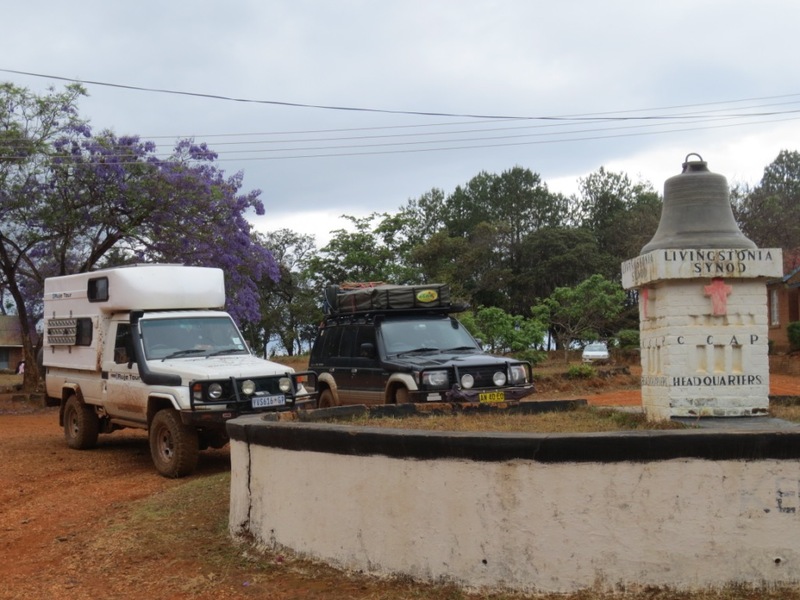 Continuing the journey north, we headed inland into the mountains travelling the 70km mountain pass road towards the remote mission of Livingstonia. That morning the clouds had begun to build in the sky and the wind had picked up, it felt like rain but the locals assured us that the rainy season was still a month away. But surely enough about an hour later the heavens opened, the first rains of the season had arrived. The top layer of dust on the hard packed clay road became a slippery muddy mess within minutes and trying to keep the car on the road was like watching Bambi on ice. The slippery mud, combined with steep hills created impossible driving conditions and things took a turn for the worse pretty quickly. Coming down a long steep incline, the car began to slide sideways and we ended up completely sliding off the road and into the bank. Fortunately it was slow enough not to cause any damage, but with the rain bucketing down and the road worsening we didn’t want to risk driving any further and so decided to find somewhere nearby to stay for the night. We drove on slowly and were so relieved to see a school just round the next corner. We drove in, both looking like muddy drowned rats and asked the head teacher if we could camp in the school and wait for the rain to clear. The wonderful headmaster, Pickford greeted us warmly and said we could camp in the school no problem. By this time, school had already finished for the day, but we were told to expect an audience of 350 children in the morning! That night, the rain continued to fall, the sound of it pattering on the tent roof tormented me all night, imagining the muddy road getting worse and worse. If it continued to rain how long would we be stuck here? I finally fell asleep reassuring myself we would wake up to blue sky, but alas, the next morning we awoke to more rain. We were up early, keen to be up and about before the children began to arrive at 6.30am. 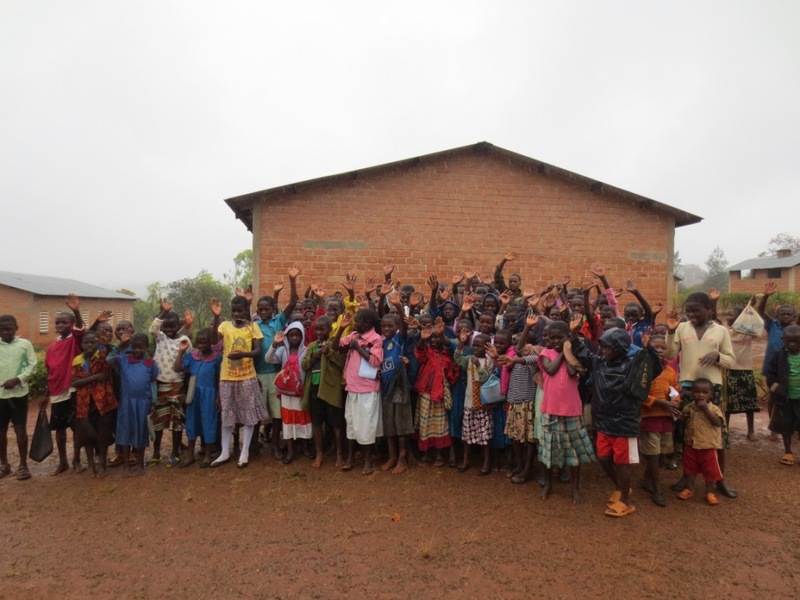 At 6am Pickford came over to invite us in for breakfast, the building of the school, funded by the UK government also included simple brick housing for 6 teachers, so he was keen to show us his home. His lovely wife Mary, prepared sweet milky Malawian tea and buttered bread which they only buy as a special treat once a month on payday, which just happened to have been the day before. Mary sliced and served the entire loaf and made the biggest flask of tea, the generosity of people who have so little is unbelievable, we felt so guilty eating their food but Pickford kept eagerly topping up our tea and refilling our plates, he was so excited to have international guests. 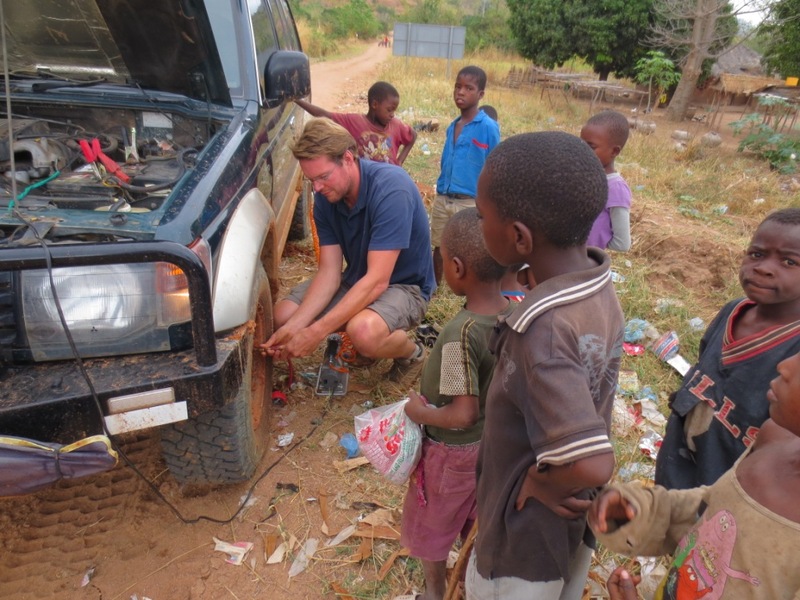 After breakfast we followed Pickford out to the school where an excited group of children had begun to gather round our car which was parked in between their classrooms. They were called to assembly, where it looks like Pickford introduced us but warned they had to keep their distance from the car as in-between lessons they would come and stand quietly in a circle a few meters away from us, staring at awe at the Muzungos who had taken up residence in their schoolyard. We were taken round the school, which caters for ages 5 – 13yrs. All the classrooms were simply equipped with desks and benches, but with bare walls and little light it was a far cry from the bright and colourful classrooms we grew up with. We sat in on a ‘leadership’ lesson which is taught to the older children in English. But with no exercise books or pens to make notes the children’s attention was quickly lost. The teachers work tirelessly, but with only 3 full time teachers and 2 assistants for 350 children it’s an impossible task. 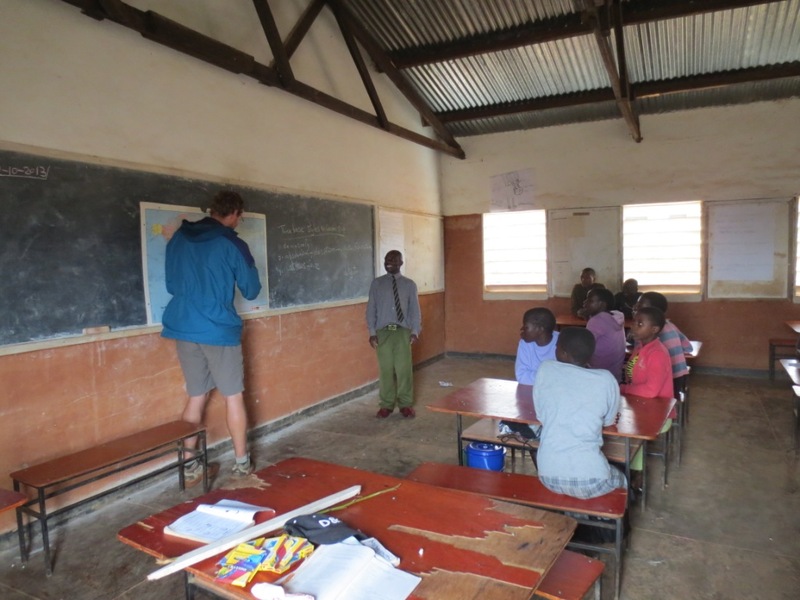 Richard took over the last part of the lesson, using the world map to talk about our trip which seemed to get their attention. A Muzungos giving them a geography lesson! Despite being able to understand English they couldn’t understand our accents. So Pickford had to ‘translate’ alongside Richard repeating the same words but in his African accent, they finally understood. After the lesson, we decided to walk to the road to see how the conditions were. A couple of trucks had been through in the night churning the road into what now looked like a ploughed field, we puzzled over what to do. The rain didn’t look like it was going to stop anytime soon, but we didn’t want to sit in the school for more days. As we were discussing the options we could hear the sound of another car coming up the hill and could not believe our eyes when the white land cruiser of Rui and Jean (Ruje Tour) came chugging round the corner. We jumped up and down waving at them, so happy to see friends, what timing! Thankfully they saw us, initially wondering who these crazy NGOs were jumping up and down, and pulled into the school, also happy to have a break from the terrible road. The children by this point were beside themselves, two big 4WDs and 4 Muzungos in their school, it is clearly not something that happens here very often! We agreed that we would buddy up and tackle the remaining 25kms together and to Pickford’s dismay we began to pack up. I think he’d begun to hope we would be there for a few days so before we left he insisted that we must all have lunch, as his wife had already started cooking nsima for us. So the 4 of us piled into his tiny home, where we were filled with nsima and vegetables. Again, another extremely generous lunch, which we were all so grateful for. 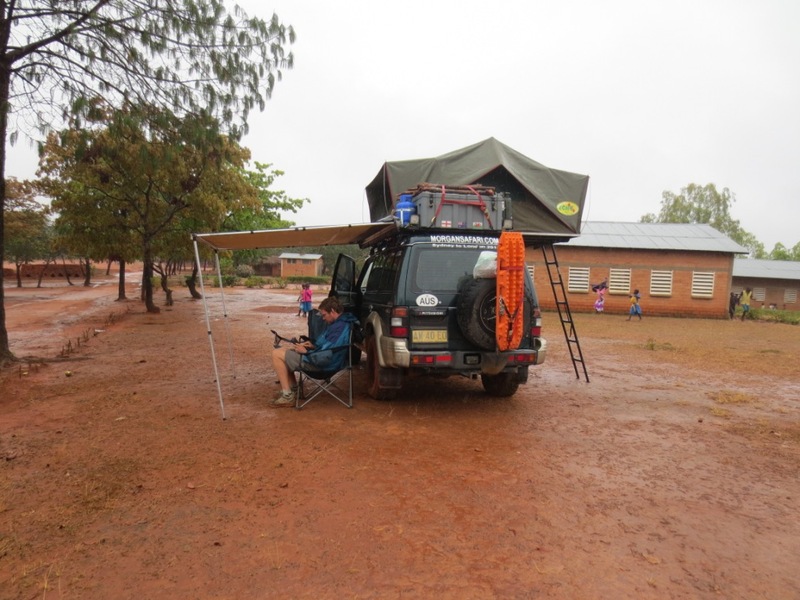 We had certainly picked a good place to be stranded for a couple of days and made sure we left good donations for the school as well as packets of crayons which we had bought with us. 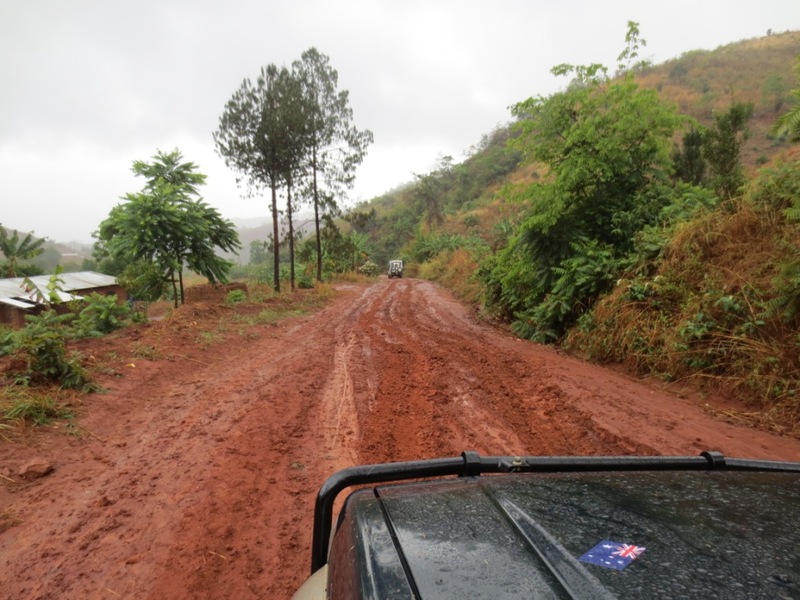 We nervously left the school and began the final treacherous 25km to Livingstonia – it took 2.5hours! We slipped and sided, thankful that we had each other’s company, but finally we made it safely to a beautiful campsite on the side of the mountain, Lukwe. The past few days had certainly been an unexpected adventure but the experience had given us a confidence boost in both ours and the cars ability. 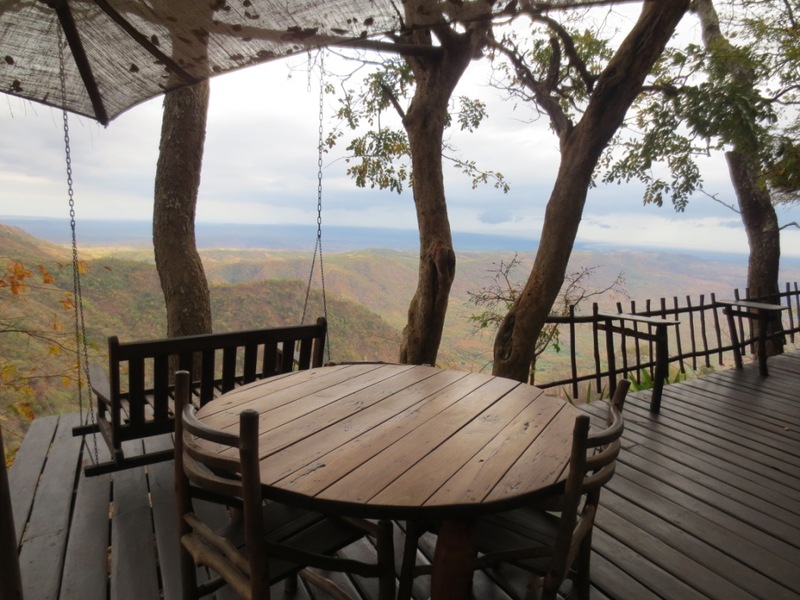 The view from the camp was magnificent, looking out across the lake, we could see all the way to Tanzania. Livingstonia itself was established as a mission in the late 1800’s to escape from the mosquitoes and tetse flies that plague the lake shores. It’s a beautiful little town perched up on the plateau with an interesting mix of colonial era buildings which we explored , including climbing up the church tower for excellent views across the lake. 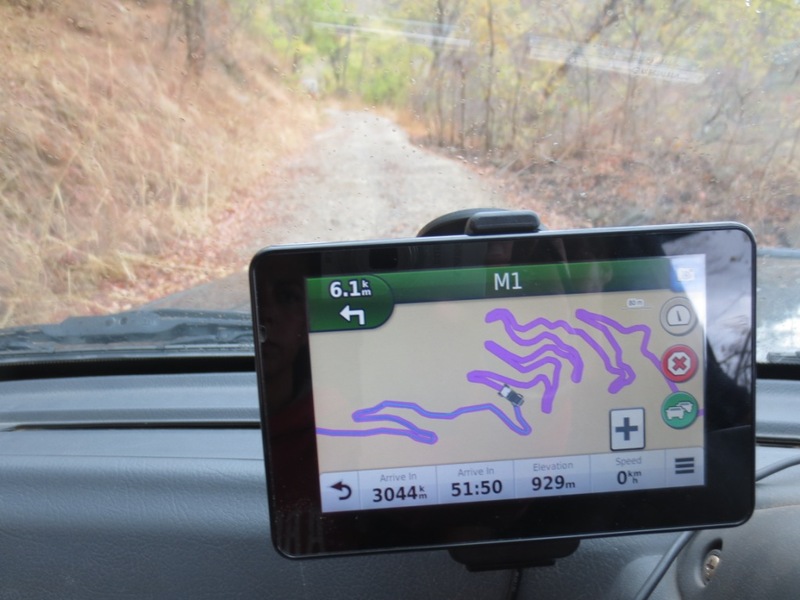 We then headed back down the mountainside, this time on the notoriously steep 20 hairpin bend road and onwards to the Tanzanian border. Thankfully we only had to pass one oncoming vehicle, passing was treacherous with sheer drop offs down into the valley below. Richard had to do a few three point turns to get round the corners, the car getting precariously close to the edge, but at least it had stopped raining at this point and despite the reputation of the road we found it rather enjoyable after the muddy journey up! The M1 was never this much fun in the UK! Sorting tyre pressures at the bottom drew quite a crowd!